The Rojahn Academy of Irish Dance is the first and only Swiss dance school registered with the Irish Dance Commission (An Coimisiún le Rincí Gaelacha, CLRG) and Registered Teachers Mainland Europe (RTME). Anne-Marie Rojahn (TCRG) founded the Swiss school in 2000. 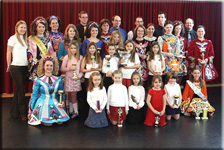 The Rojahn Academy of Irish Dance offers courses for all levels and ages. Main locations are Basle and Zürich, and recently also in Biel. Students regularly participate at Feiseanna (Irish Dance competitions), including the European Championships & Oireachtas as well as the World Championships. The dancers of the Rojahn Academy perform both nationally and internationally and some students also have plenty of experience with film and television work. As a child, Anne-Marie Rojahn was an avid gymnast, took up the sport at the tender age of five. In addition she also focused on tower diving and figure skating. For many years she studied tap dance with Ms. Roberts (Royal Academy of Dance, London) and discovered her passion for Irish dancing in particular, which has lost nothing of its fascination for her since. She studied at renowned Irish dance academies in England, Canada and Australia and for years successfully competed and performed in many shows worldwide. Anne-Marie made history with An Coimisiún (CLRG) in Belfast, Ireland in 2004 by being the first ever mainland European and Swiss to have passed the teachers (TCRG) exam. In collaboration with Registered Teachers Mainland Europe (RTME) she so far organised five world championship qualifiers (Oireachtasi) throughout Europe and designed the RTME logo. For five years she was also head of the PR team and editor of the Oireachtas brochure, and for three years she was head of finance. Anne-Marie is a physician (specialising in surgery and emergency medicine), radiographer (in nuclear medicine & diagnostic radiology) and is currently writing her doctorial dissertation at the University of Basle. In addition to dancing and medicine her great passion is aviation. The youngest dancers at the Rojahn Academy of Irish Dance are four years old; the eldest are in their fifties. Although some dancers started their Irish dancing career at other schools, many of them have danced with the Rojahn Academy since its foundation. All dancers  regardless of age  have the possibility to participate in shows. The only requirements are mastering a certain number of dances as well as show enthusiasm and enjoy performing in front of an audience! Most dancers regularly participate in competitions (Feiseanna), a great opportunity to put one’s ability to test and meet dancers from other countries and backgrounds, enjoy and share the love for Irish dance and music. Our Academy has produced the first Swiss World Championship Qualifiers in Solo- and Ceili dancing, the first Swiss European Champion as well as numerous Open- and Adult Champions. For many years we have had and have dancers who qualify for and compete at the annual World Irish Dancing Championships, All Irelands and All Scotlands.